Groundbreaking has been set for May 27 at old marine hospital. 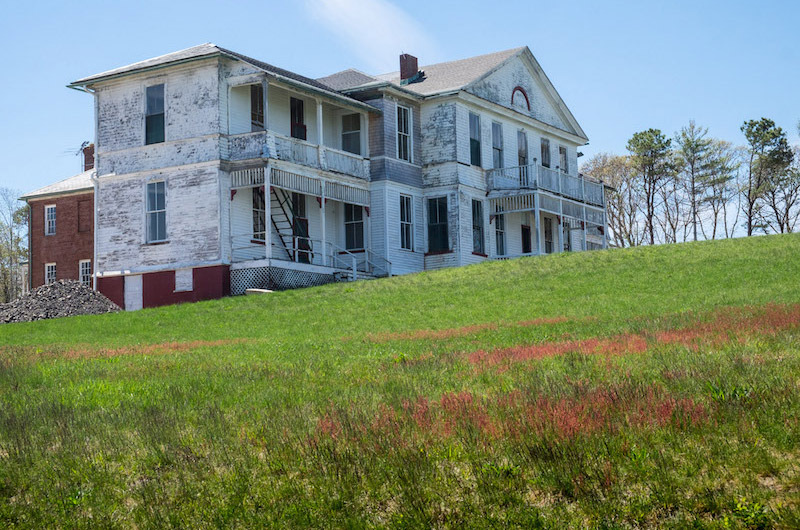 A groundbreaking ceremony is set for late this month after the Martha’s Vineyard Commission voted last week to approve the Martha’s Vineyard Museum’s plan to renovate and expand the old marine hospital in Vineyard Haven. The vote clears a final major regulatory hurdle for the museum in its multimillion-dollar plan to relocate its main campus from downtown Edgartown to the hilltop site in Vineyard Haven overlooking the Lagoon Pond and outer harbor. “Last night was a huge milestone for use,” museum executive director Phil Wallis said Friday morning following the unanimous vote by the commission Thursday night. “The construction firm is ready to put the shovel in the ground. It’s quite frenetic right now, all good but a lot going on.” He said a groundbreaking is planned for May 27. The commission reviewed the project as a development of regional impact. The plan calls for restoring the architecturally stunning but dilapidated former hospital building that dates to 1895, and construction of three new buildings for functions, exhibit spaces and offices. The approval includes 34 separate offers from the museum, including a number of conditions to mitigate traffic, light pollution and noise, and promote energy conservation. Among other things, the museum will be required to use the high school parking lot as a satellite lot to shuttle patrons to large events. It has agreed to pay for the design and construction of a sidewalk along a marshy section of Lagoon Pond Road. He said the museum has raised $15 million in cash and pledges, and needs to secure $9 million more for the $24 million phase one of the project. The MVC imposed seven specific conditions. Through a memorandum of understanding with the town of Tisbury, no amplified music will be allowed at private events such as weddings or parties. Amplified music at the museum’s own public events will be limited to six per year. And the museum has agreed to continue its practice of providing free or subsidized housing for summer interns. The project has been in the works since 2011. The first phase of the project includes renovating the main building, demolishing a brick addition that dates to 1938 and adding nearly 10,000 square feet of space with two new buildings. A second phase envisions a new two-story gallery wing and connector walkway to the renovated main building. The museum plans to move its operation and collection of some 15,000 historical artifacts to the new site in Vineyard Haven. Museum directors envision the new facility as a cultural hub for the Island, where people can learn about the history of Martha’s Vineyard. Also last Thursday, the MVC opened a public hearing on a plan for a medical marijuana dispensary in West Tisbury. The applicant is Geoff Rose, doing business as Patient Centric of Martha’s Vineyard. Mr. Rose has received a license from the state Department of Public Health to operate a dispensary at 505 State Road in West Tisbury, a former hardware store in the North Tisbury business district. But he said that location proved too small and he now hopes to situate the dispensary at 90 Dr. Fisher Road, in a warehouse-style building owned and partially used by Big Sky Tent and Party Rentals. Mr. Rose would share the space with Big Sky. His business plan calls for a 1,000-square-foot growing space, offices and a testing lab. The Dr. Fisher Road is a special way located in a district of critical planning concern. In a presentation to the commission, Mr. Rose outlined how the clinic would work, operating by appointment only six days a week from 9 a.m. to 5 p.m. on weekdays and 10 a.m. to 5 p.m. on Saturday. He described an extensive security system including infrared lighting, surveillance cameras in every room and a network of cameras outside the building. He said marijuana would be tracked with bar codes from seed to sale, to insure against theft or diversion outside the normal security parameters required by state law. A vault would store both marijuana and cash. Mr. Rose said he anticipates the business will grow to 400 customers in four years. Appointments will be limited to seven per hour. A number of abutters attended the hearing, and testimony was mixed. Daniel Larkosh, who lives near the proposed facility, said it would be far less intrusive than other nearby businesses which include a trash disposal company, landscaping company building materials operation. Other neighbors were less enthusiastic, citing the location on a narrow, privately-owned dirt road, traffic and security concerns as negatives. Mr. Rose projected 150 vehicle trips per day to the facility. But Sumner Silverman, who said he uses medical marijuana to relieve symptoms of cancer treatment, said it is important to have a dispensary on the Island, since federal law prohibits possessing marijuana aboard Steamship Authority ferries. Chris Egan, a resident of the neighborhood, noted the extensive security required for the facility which is expected to be a mostly cash business with a desirable and valuable product. After 90 minutes, with several abutters still waiting to speak, the commission continued the hearing to May 18. Commissioners asked Mr. Rose for more information in writing about vehicle and pedestrian traffic projections, lighting plans, and any plans for outside back up electricity generators. This traffic issue looks to be the same as the residents of Iron Hill Farm have to deal with. People who drive to the CSA at Thimble Farm for the Island Grown Initiative are driving on a road paid for by private residents. However, everyone makes that work. I am sure something can be worked out here. I don't think traffic should be a real concern. Does Thimble Farm have 150 customers per day, six days per week? That is the projected number of trips, according to the MVC. It really is amazing we have any business here at all on the Island with an Island full of NIMBY'S. The Martha’s Vineyard Historical Society doesn’t have a whaling ship for its museum, nor a schooner. Vineyard Voices: Words, Faces and Voices of Island People. Excerpts from Interviews by Linsey Lee.